The average American garage is a messy place. Although it is supposed to be the place where the family car is stored, it soon becomes home to all the miscellaneous items in your home or else it hosts all your DIY equipment which can’t be kept in the home because of the stains it would leave. Below are some easy garage storage solutions which will help you tidy up this important room while also creating space for more items in the future. The key to having a clutter free garage is to utilize as much space as possible. Although the average garage has some 150 square feet of space available that is not used properly because of the way in which materials are stored, it pays to use every available inch. You can install shelves which suspend from the ceiling and use the space that’s found above the garage door. This garage solution is available to you if there is 16 inches or more of room available above the garage door. These shelves are perfect for storing lightweight items. Their main weakness is the fact that heavy equipment can’t be stored on them but then again, it’s always dangerous to store heavy items overhead so perhaps this is a good thing. Bikes take up a huge amount of space on the garage floor and can be awkward to deal with. A common solution is to install hooks to the walls or ceiling where the bike can be hung. However, the bike may be too heavy to lift onto these high hooks so a bike lift is a better solution. This is a pulley system which is capable of lifting a maximum of around 100 pounds. This type of lift has a locking mechanism and tie-down cleat which ensures that the bike stays secure. The bike should hang around four foot from the ceiling. Ladders are another major user of space in a garage. Like bikes, they can be hung on hooks but they carry the same problem of being too awkward and heavy. You should create two wall brackets using timber and a PVC pipe. This allows the ladder to be stored flat across the ceiling. Just make sure that the ladder is a few inches longer than the distance between the brackets so that it stays secure. If you have a wheelbarrow in your garage, you understand the irritation it can cause as it always manages to get in the way. Home Depot sell specific wheelbarrow holders which enable you to attach it to the wall. The wheelbarrow should be facing into the wall and secured by the storage brackets. 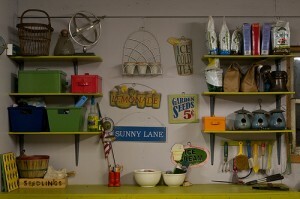 The two biggest issues with garages are lack of space and clutter. What most families don’t seem to realize is that one comes with the other. If you de-clutter the garage, space will automatically appear. There are a host of innovative ways in which you can add space which will turn your garage into a useful storage facility rather than a junkyard.